First time writer balances dry punchy humour with moments of blatant honesty and pathos, writes Stephanie Makhlouf. It could be said, most likely, that on our life time, the majority of us will not have the opportunity to witness a stage play on grand stages such as West End or Broadway. Luckily, we have an alternative. National Theatre Live gives audiences the opportunity to watch some of the top actors of our time performing in plays recorded and screened in cinemas around the world. If the thought of watching a play on a cinema screen overwhelms you, then The Last of the Haussmans should put your mind at ease. 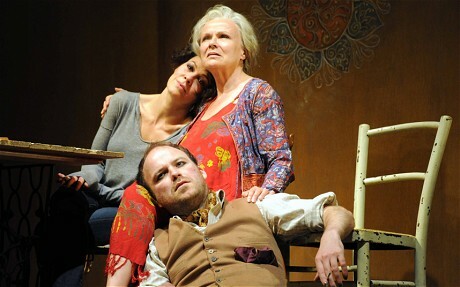 A feisty, free-spirited and mildly inappropriate woman, Judy Haussman (the incomparable Julie Walters), who's stuck on her memories of days gone by, creates an almost forced reunion between herself and her two enstranged children when, after falling ill, she needs to be nursed by hard as nails Libby (Helen McCrory) and the gay drug-addicted Nick (Rory Kinnear). Both are forced to confront and come to terms with Judy's abandonment of them as children as old wounds are opened and discussed. To complicate matters further, we are introduced to Peter, a local doctor who has a romantic history with both mother and daughter. We also encounter three colourful generations of women as we meet Libby's daughter, uncharacteristically named Summer. Clearly Summer has inherited her mother and grandmother's habits and threatens for the cycle of self-destruction to continue. Walters delivers a particularly brilliant performance. From the minute she appears on screen she captures our attention as she lives and breathes every inch of her troubled character. We don't get a sense of absolute closure by the ending. Yet, perhaps and even more satisfying, we get the sense that each character has a brighter future ahead of them now that they have confronted the ghosts of their pasts. A strong ensemble cast along with an outstanding script make The Last of the Haussmans a worthwhile night out.